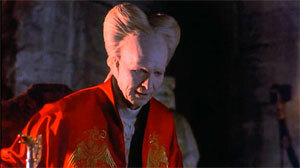 As faithful readers of this site probably know by now, “Bram Stoker’s Dracula” is one of my favorite films, and one I enjoy revisiting it over and again. I do not consider it a guilty pleasure, but the enjoyment of a true piece of cinematic art. Some critics dismiss the film as being poorly conceived, but I would suggest that these writers simply have not a single creative or lyrical bone in their bodies, as they overlook the movie’s biggest achievements – it’s visual beauty, its marvelous tapestry of colors, emotions and old-school style. Since its release, Francis Ford Coppola’s artistic and dazzling approach to the classic gothic tale about the bloodsucking prince of darkness has found a place in the hearts of millions of film fans. Never intended to be a traditional horror film, it is a very beautiful version of the story, heartfelt, emotional and romantic, while also remaining one of the most faithful adaptations of Bram Stoker’s novel – although admittedly, even it still strays quite a bit. A Special Edition of the film has been released a few years ago, but as you might recall, the transfer of the film was not up to par, with an image that was murky and way too dark, losing vital image detail throughout. With this new “Supreme Cinema Series” release of the movie, Sony Pictures Home Entertainment now wants to rectify the problem, and I was extremely eager to take a look. 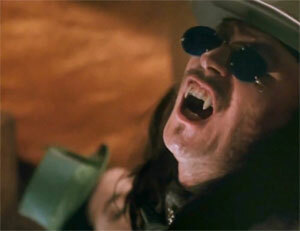 “Bram Stoker’s Dracula” is not the usual monster movie you would expect at first. Instead, it’s a very romantic story, portraying the vampire count as a tormented being with emotions that, like his body, never die. Suffering from his existence, Dracula is tracked by his nemesis Dr. Van Helsing and hunted down for a climactic finale in the yard of his own castle. The lush and colorful production design, shot almost entirely on soundstages, combined with the vivid and sometimes surreal imagery created by cinematographer Michael Ballhaus, made this movie a cinematic feast in 1992 — a feast not only for genre lovers. Don’t be fooled, however; despite all its splendor, romance, and charm, Dracula still retains its horror roots with plenty of blood and gore. The movie starts before the actual novel from 1897 takes place, showing Dracula (in a true powerhouse performance by Gary Oldman) as a Romanian knight, fiercely battling the Turkish Empire. 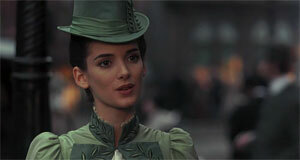 A false letter from the Turks sends his wife Elisabeta (Winona Ryder) to her premature death. Leaving the battlefield after a premonition, Dracula finds his beloved wife in a pool of blood and condemns life and God Himself in a very spectacular, blood-soaked cinematic moment. Four hundred years later Jonathan Harker (Keanu Reeves), an aspiring solicitor, and real estate broker, travels to Transylvania in order to finalize the sale of an old London abbey to Dracula. Chased by wolves and strange glowing mists, he finally arrives at the towering castle, only to find a weird and seemingly frail old man. Soon enough, he realizes that this man has more power than he could have possibly imagined. When Dracula finds a picture of Harker’s wife Mina (Winona Ryder), he sees his lost wife Elisabeta in her and decides to travel to London, leaving Harker back at the castle at the hands of some of his lascivious vampiric minions. The rest is almost history and features some of the most memorable moments in movie history, including Anthony Hopkins’s brilliant portrayal of Dracula’s nemesis, Dr. Van Helsing. 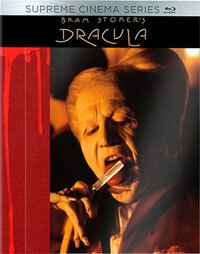 Focusing mainly on the romantic aspect of Dracula’s tormented soul, his eternal love for his wife and her reflection/reincarnation in Mina, this movie has a completely different tone than any other adaptation of the vampire’s theme. “Bram Stoker’s Dracula” is definitely a tough nut to bust when it comes to capturing all the details and delicate shades of the movie. Coppola’s production is rich and colorful, reveling in shades of blood-red and night-blue, while often shifting the tonality of the entire image from warm earth tones to more frivolously saturated stylized shots, all the way to cool blues. 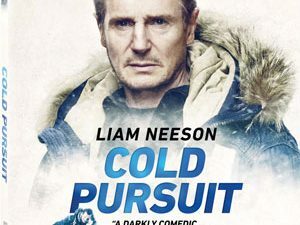 For this Cinema Supreme Series version of the film, Sony has created a brand new 4K master of the film and struck this new 1080p high definition transfer from this master. To get a proper impression of the improvements, I decided to view this new release, and the previous Blu-Ray version side by side. It took me no more than 30 seconds to realize just how outstanding the improvements are. It’s like night and day! 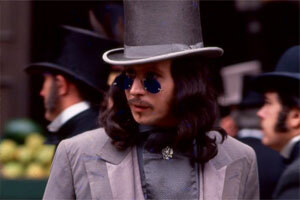 At long last, “Bram Stoker’s Dracula” has received a transfer that does justice to the opulent production. The increased amount of detail is instantly visible. Where the old transfer was blurry, this new version now renders an image that is razor sharp and highly detailed, bringing out every bit of image information in the rich design. It is accompanied by wholly improved black levels that finally create an image with solid contrast where even the dark shadows maintain proper image information at all times. For a film like “Dracula,” this is imperative because so much of the atmospheric imagery is bathed in shadows and blacks and very many details are embedded in those shadows. They are no longer lost but presented in sharp detail. What is also instantly noticeable is the improved color of the transfer. I remember how murky the initial Blu-Ray version was and how muted the colors were. It was disappointing because one thing that appealed to me so much when I watched the movie in theaters countless times was the richness and saturation of these colors. Fortunately, this Cinema Supreme Series version delivers in abundance. Hues are absolutely vibrant. The red skies of the train ride, the deep blues of the skies over Castle Dracula, the red in his gown, the interior of Hillingham, the costumes—you will be mesmerized by their lushness and the beauty of the colors. The transfer is also more robust with less grain than before, but entirely without a sense of digital scrubbing. You will still notice grain in various scenes, but it is organic and belongs there, and it is great to see that Sony, unlike some other studios, did not entirely whitewash the transfer, but instead opted to stick to the original look of the film stock, and the result speaks for itself. It is the most gorgeous transfer of the film I have ever seen! This version of the film arrives with a Dolby Atmos audio track ensures the most accurate representation of the original track possible. With lossless compression and untethered 3-dimensional placement of sound effects, the track has an incredible clarity and spatial transparency that has to be heard. It is mesmerizing and adds a new dimension to the film. The overall mix is also much more balanced as in he previous Blu-Ray release, making sure that dialogues are always clear and understandable, with good frequency response and solid basses. The much-improved surround field opens up the ambient sounds of the film, particularly in moments with crowd scenes and the subtle whispering that reverberates through Castle Dracula. The high dynamic range of the tracks give the movie the necessary punch to make it the ultimate experience and the wide frequency response help to make Wojciech Kilar’s menacing celli even more foreboding while the crystal clear violins and choirs help to build tension for the movie’s breath-taking finale. Fortunately for fans, the release brings back all the great bonus materials found on the previous Blu-Ray disc, including the commentary track with Francis Ford Coppola. In addition, it also contains a second commentary, featuring Francis Ford Coppola, his son and visual effects director Roman Coppola and make-up supervisor Greg Cannom. All of these commentaries are incredibly insightful and brimming with tidbits, reflections, and anecdotes. Equally insightful are the featurettes found on the disc. “The Blood Is The Life” is a general making-of featurette, but unlike most of today’s fare, this is really a behind the scenes look at the making of the film. With plenty of on-set footage, occasional talking head interviews and a wealth in information, this is what making-of featurettes used to be like before they became part of the fast food culture. It is, however, for the most part, the 1992 Making-of featurette that was used to supplement the theatrical run of the movie, and has been edited only very slightly. Eiko Ishioka’s award winning costumes are revisited in a separate featurette as well offering a very close and personal look at the wardrobe and the approach she took to designing the costumes for this film, making the costumes the center of the production design. The nice thing about this featurette is that you get the chance to see many of the intricate details of these costumes that are not as evident in the movie itself. Of course, hearing Eiko talk about her work and Coppola’s intentions is wonderful, also. One of the absolute highlights of the disc is the featurette “In-Camera: The Naïve Visual Effects Of Dracula.” Don’t be fooled, there is nothing naïve about the effects or this featurette as it dives head-on into the remarkable approach the filmmakers took to visual effects on the movie. 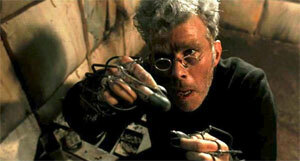 Without going digital, all visual effects in the film have been created optically, in-camera. It is an art that has been completely lost since the dawn of optical printers with “Star Wars” and, of course, the more recent digital revolution. To see filmmakers go 100 years back in time to create spectacularly looking visual effects that are composed live on the set is simply staggering, especially considering that these effects are every bit as good as their digital counterparts. “Method And Madness” is a close look at the visualization process of the film, how the look and production design was approached. Altogether these are some of the best and most insightful featurettes I have seen in a very long time and best of all, they are all presented in high definition! To put the lid on things, the disc also contains twelve deleted scenes running over 30 minutes in length. Brace yourself for some cool moments as you get to see footage that could just as well have ended up in the final film. Sadly they are presented in 480p standard definition only and are of pretty poor image quality. In a world where movies have become brainless fare for immediate consumption with a throw away sentiment, films like “Bram Stoker’s Dracula” stand out as shining examples that there still are filmmakers out there with strong visions and ideals. No matter how many times I’ve seen this movie, I always walk away with something new and I always walk away impressed and deeply gratified. This is art! Just like an intricately layered picture of Leonardo DaVinci. Just like there are people who do not see the appeal of a DaVinci, there will always be people who fail to see the qualities in “Dracula” and frankly, I pity these people, because they are missing out on some of the most remarkable artistic expressions of cinema history. If you are wondering if you should upgrade your existing Blu-Ray version to this newly released one, the answer is simply. Yes! There never has been a more qualified reason to upgrade, because this new transfer of the film will pull a veil from your eyes and let you re-experience the movie in a whole new way. Order your copy now!